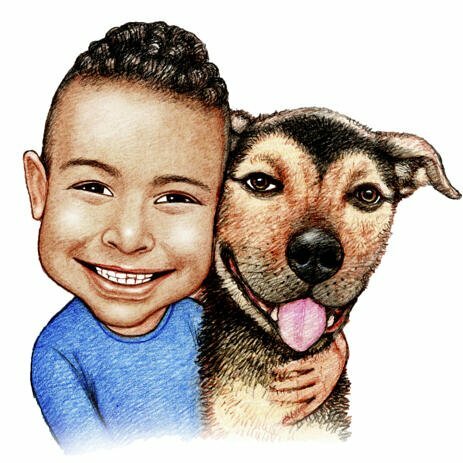 Order a color pencils caricature of child with pet, hand-drawn from photo by our talented artist. Such a cute caricature will be created according to your photos and ideas. Pencil Caricature of a child with pet can be gifted on any occasion. Imagine how happy will be a child by receiving this wonderful drawing of him/her with lovely pet, which will be exactly the most memorable item for a long life. We can draw any breed of dogs and cats of your choice. We guarantee you a high quality drawing which will be delivered as a stunning looking JPG file to your Email. We offer you other suitable delivery options at extra cost: Color Caricature of a child with pet printed on Canvas, Photo Paper with worldwide shipping.